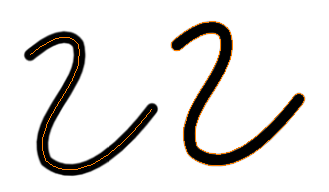 You may have drawing stroke using the Pencil tool when you wanted to use the Brush tool. You may also have drawing your image using the Polyline tool and now you want to convert your strokes to brush strokes. For many reasons, you may want to switch your stroke types to another type to use the various advantage set they offer. Harmony lets you convert pencil lines to brush strokes, brush strokes to pencil lines, and invisible strokes (strokes) to pencil lines. You can also break text objects apart—see Breaking Text Into Letters or Vector Shapes.